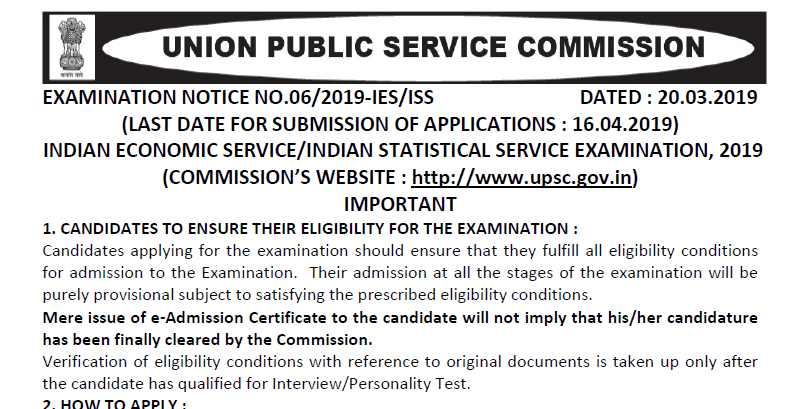 UPSC IES and ISS 2019: Union Public Service Commission has published notification for Indian Economic Service and Indian Statistical Service Examination, 2019. Registration for the examination has already been started. Interested and eligible candidates can apply for the examination at the official website of the commission. UPSC IES and ISS 2019 Exam notification was released on March 20th, 2019. And Last date for online application is April 16th, 2019. For Indian Statistical Service a candidate must have a Bachelor's Degree with Statistics/Mathematical Statistics/Applied Statistics as one of the subject or a Master's degree in Statistics/Mathematical Statistics/Applied Statistics.